Are you ready? We’re showing a double feature this week with two collections you’re going to be eatin’ right up. The Mr. Food Test Kitchen has been hard at work developing plenty of free eCookbooks for every occasion, and we’re so excited to tell you about two of them: Game Day Recipes and Easy Weeknight Dinners. Whether you’re looking for finger foods and other appetizer recipes for the upcoming championship football game or you’re just looking for some of that “Quick & Easy” cooking during the week, then our collection of weeknight dinner recipes might just be for you. Take a peek at these fantastic collections. When the whistle blows and the clock’s running, you don’t want to have to lay all your faith in the pizza guy for tasty munchies during the big game. All you have to do is get in your kitchen with our latest collection, Game Day Recipes: 30 Best Munchies for a Crowd! With an array of recipes like our homemade pizzas, tasty finger foods, easy dips, and so much more, why would you ever want to go anywhere else? 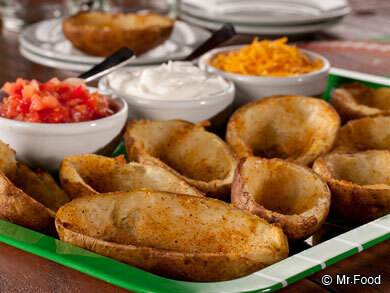 We’ve even enlisted the help of our friends over at the Idaho Potato Commission for tasty potluck recipe ideas like our Half-Time Skins (pictured below). Set out your table full of munchies for the whole gang: the chicken wings, the mozzarella sticks, the homemade dip, the fries, and everything else. With a spread like this, you’ve got a watch party to remember! With the school year back in full swing, there’s hardly any time to remember to brush your teeth at the end of the night, let alone spend hours in the kitchen preparing dinner. With our collection of Easy Weeknight Dinners: 20 Recipes for a Busy Cook, the Mr. Food Test Kitchen makes it easy with homemade dinners you will have time to make. With easy-to-find ingredients and our signature “Quick & Easy” cooking style, you can breathe a sigh of relief when you see just how simple it is to make sure the kids have a home-cooked dinner. We’ve covered all the basics with recipes using chicken, simple beef recipes, easy seafood recipes, and much more for a family dinner you’ll want to remember. 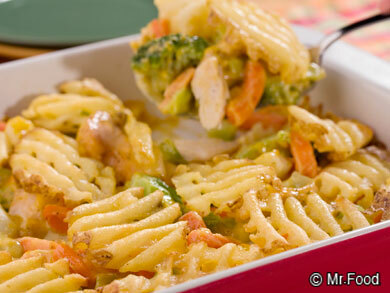 I mean, look at the photo of that Waffle Fry Chicken Bake below. Doesn’t it make you hungry already? We hope you’ll want to check out our free eCookbooks, Game Day Recipes and Easy Weeknight Dinners. Whether you’re looking for a finger food classic for you and your friends or you’re just trying to get dinner on the table, we bet you can find something to love with either collection. Enjoy!